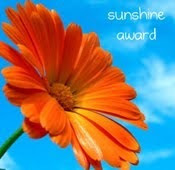 This beautiful Sunshine Award was given to me by Doña Masita. Those of you who are fans of Mexican food might know her from her wonderful recipes that she shares on the Maseca website. Monica H @ Lick the Bowl Good...Oh wow! You are all going to love her blog. She has the best recipes and her photographs are simply breathtaking. Tancho @ Rancho Canyon Cookbook...A fellow expat whose recipes are always so inspiring. His recipe for Really, Really, Really Quick Bread has become one of my favorites. Don Cuevas @ My Mexican Kitchen...Another fellow expat whose recipes are some of my favorites, like his recipe for Homemade Sausage! Lesley @ The Mija Chronicles blogs about life in Mexico City AND posts some of the most creative recipes like her Spicy Oatmeal with Peanuts, Cilantro and Ginger. Anabel @ Oven Delights...I love her cakes and am more than just a tad bit jealous of her cake decorating skills. I hope that someday she will start her own business. Tami @ I don't like mama...Another talented cake/cupcake decorator who recently started her own business. Her creations are almost too pretty to eat. Almost! Katie @ Apple & Spice is always creating tasty treats in her kitchen. Today she posted the cutest Easter Pizza that looks like a beautifully decorated Easter egg. My friend Jeff @ Chef Traveler offers a wide variety of recipes that are low in fat! He even has a daily newsletter that you can subscribe to by email. Luigi @ Luigi's Tastes of Italy...I love Italian food and Luigi's recipes for Zuppa di Piselli and Parmigiana di Zucchini are ones that I will be making often! Last but definitely not least is Heather @ Kitchen Concoctions...Heather picks one cookbook to cook from for a month and posts the recipes and her opinions about the featured book. I recently won this cookbook in one of her giveaways. I hope you will pay them all a visit! stopping by from SITS - congrats on your blog award! Off to search your recipes and check out your nominees! Thanks for your kind comments on my blogsite, Leslie. Congratulation! Isn't it great to be recognized! Well Leslie Thank you! It is nice to know that someone enjoys a recipe one posts, makes the effort in writing down the recipes more enjoyable knowing that you can share your favorite eats. First of CONGRATS on your first award! You deserve it! Leslie, you are trully inspirational! Thank you for sharing your recipes, and for sharing your memorable family moments with us. Thank you for keeping it simple and reminding us of what really is important. You have such a beautiful family,and they are so lucky to have you! Thank you my dear for passing this award on to me. I truly appreciate it! You are so deserving as well. Congrats on your first award. You are an inspiration to many. Congratulations, Leslie, on receiving a reward for your wonderful blog. You've inspired me to add many more Mexican dishes to my cocina and each one has been delish! Congrats on your blog award and thank you for sharing it with me! Thank you so much for being such a loyal reader of my blog for the past year! Oh PS I am so glad you got your blog back up and running! I was checking by all day yesteray so that I could leave a comment! Hi Leslie, I am such a dufus. I came and saw the award. Then I was called away from my computer and totally forgot about it. I want to thank you very much, though my cooking blog is nowhere near as consistent or well done as yours is!